Created by an innovative web technology developer and its company based in Sydney, Australia, NationMaster is both a statistical database and a source of country information, as well as a tool for research and teaching. 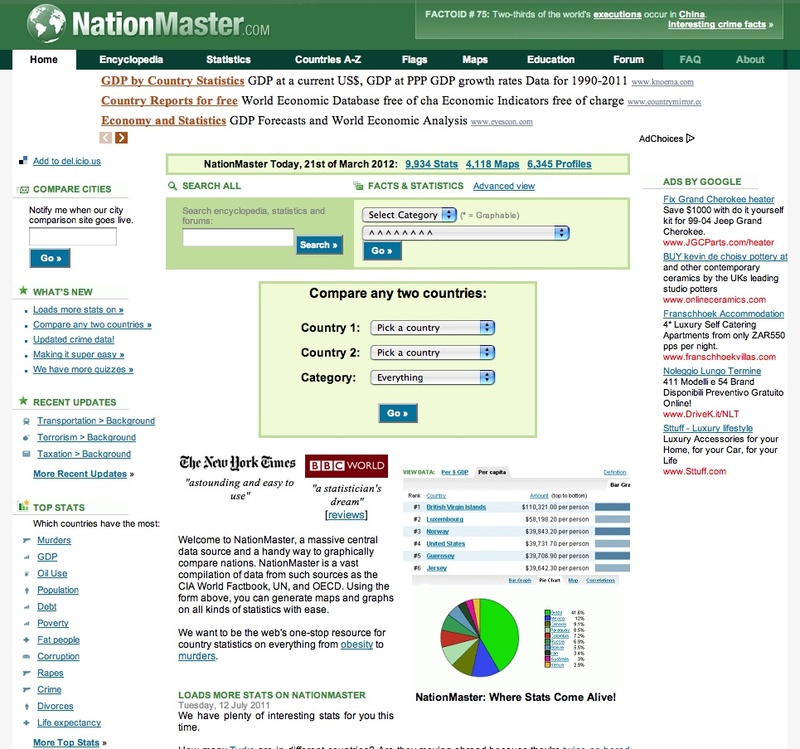 This website allows to retrieve a vast compilation of statistics and nation comparisons by providing data from authoritative sources such as the CIA World Factbook, UN, OECD and other organizations. Users can retrieve statistic info on several topics, as well as view profiles of individual countries, including their maps and flags. Statistics are all provided with methodological explanations and sources, notes and comments. The possibility of establish variable correlations and visualize the (already ordered by statistical relevance) related graphs is also present. Access to all statistics and databases is totally free for all users. A printer-friendly version is available and onscreen saving is always possible. A basic keyword search engine permits item location in a quite dense environment. NationMaster is fully integrated with Wikipedia, the free content online encyclopedia, and a Forum section is open for comment revision. Moreover, a specific section provides some learning tools for students and lessons for teachers. This site features an RSS feed option and also several ads provided by Google AdSense program.